Psssst, WaPo, Your Bias Is Showing! Local D.C. leaders have long been against the voucher program, arguing that it diverts money and students away from the public school system. But federal funding for the local schools system is tied to the legislation, and Mayor Muriel E. Bowser (D) and some council members have expressed support for the bill. So unnamed “local D.C. leaders” oppose the voucher program, but the Democratic mayor and “some” council members support it. How many council members? WaPo, you can do better than that. Last week, the Cato Institute held a policy forum on school choice regulations (video here). Two of our panelists, Dr. Patrick Wolf and Dr. Douglas Harris, were part of a team that authored one of the recent studies finding that Louisiana’s voucher program had a negative impact on participating students’ test scores. Why that was the case – especially given the nearly unanimously positive previous findings – was the main topic of our discussion. 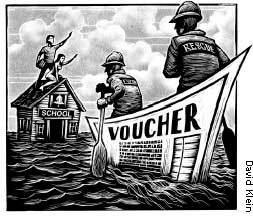 Wolf and I argued that there is reason to believe that the voucher program’s regulations might have played a role in causing the negative results, while Harris and Michael Petrilli of the Fordham Institute pointed to other factors. The debate continued after the forum, including a blog post in which Harris raises four “problems” with my arguments. I respond to his criticisms below. Problem #1: Trying to discredit traditional public schools by placing test score trends and expenditure changes on one graph. These graphs have been floating around for years. They purport to show that spending has increased much faster than expenditures [sic], but it’s obvious that these comparisons make no sense. The two things are on different scales. Bedrick tried to solve this problem by putting everything in percentage terms, but this only gives the appearance of a common scale, not the reality. You simply can’t talk about test scores in terms of percentage changes. The more reasonable question is this: Have we gotten as much from this spending as we could have? This one we can actually answer and I think libertarians and I would probably agree: No, we could be doing much better than we are with current spending. But let’s be clear about what we can and cannot say with these data. Harris offers a reasonable objection to the late, great Andrew Coulson’s infamous chart (shown below). Coulson already addressed critics of his chart at length, but Harris is correct that the test scores and expenditures do not really have a common scale. That said, the most important test of a visual representation of data is whether the story it tells is accurate. In this case, it is, as even Harris seems to agree. Adjusted for inflation, spending per pupil in public schools has nearly tripled in the last four decades while the performance of 17-year-olds on the NAEP has been flat. Producing a similar chart with data from the scores of younger students on the NAEP would be misleading because the scale would mask their improvement. But for 17-year-olds, whose performance has been flat on the NAEP and the SAT, the story the chart tells is accurate. Problem #2: Repeating arguments that have already been refuted. Bedrick’s presentation repeated arguments about the Louisiana voucher case that I already refuted in a prior post. Neither the NBER study nor the survey by Pat Wolf and his colleagues provide compelling evidence that existing regulations are driving out potentially more effective private schools in the Louisiana voucher program, which was a big focus of the panel. Here Harris attacks a claim I did not make. He is correct that there is no compelling evidence that regulations are driving out higher-quality private schools, but no one claimed that there was. Rather, I have repeatedly argued that the evidence was “suggestive but not conclusive” and speculated in my presentation that “if the enrollment trends are a rough proxy [for quality], though we can’t prove this, then it would suggest that the higher-quality schools chose not to participate” while lower-quality schools did. As I wrote previously, the study he cites, by Patrick Wolf and colleagues, actually says that what private schools nationally most want changed is the voucher’s dollar value. In Louisiana, the authors reported that “the top concern was possible future regulations, followed by concerns about the amount of paperwork and reports. When asked about their concerns relating to student testing requirements, a number of school leaders expressed a strong preference for nationally normed tests” (italics added). These quotes give a very different impression that [sic] Bedrick states. The supposedly burdensome current regulations seem like less of a concern than funding levels and future additional regulations–and no voucher policy can ever insure against future changes in policy. Actually, the results give a very different impression than Harris states. The quote Harris cites from the report is regarding the concerns of participating schools, but the question at hand is why the nonparticipating schools opted out of the voucher program. 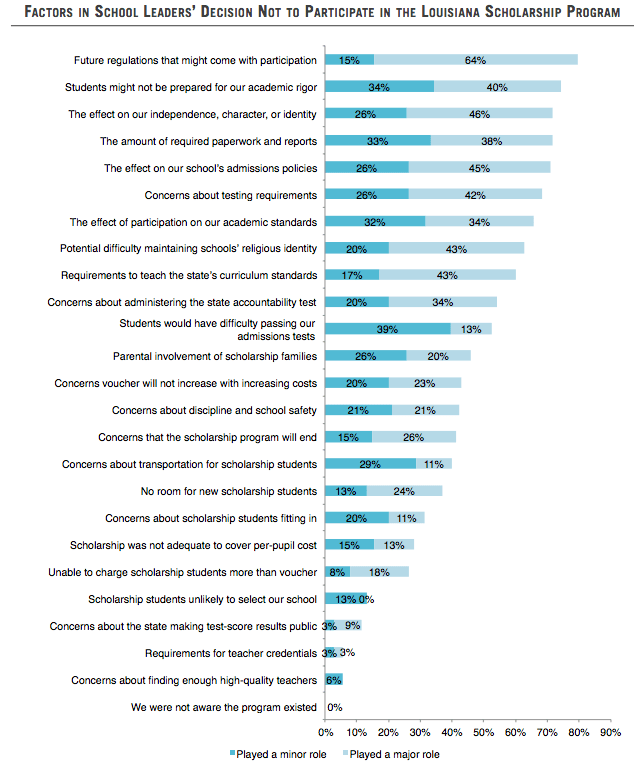 Future regulations was still the top concern for nonparticipating schools, but current regulations were also major concerns. Indeed, the study found that 9 of the 11 concerns that a majority of nonparticipating private schools said played a role their decision not to participate in the voucher program related to current regulations, particularly around admissions and the state test. Nearly all of the nonparticipating schools’ top concerns related to the voucher program’s ban on private schools using their own admissions criteria (concerns 2, 3, 5, 7, 8 and 11) or requiring schools to administer the state test (concerns 6, 9, 10, and possibly 7 again). It is clear that these regulations played a significant role in keeping private schools away from the voucher program. The open question is whether the regulations were more likely to drive away higher-quality private schools. I explained why that might be the case, but I have never once claimed that we know it is the case. Problem #3: Saying that unregulated free markets are good in education because they have been shown to work in other non-education markets. […] For example, the education market suffers from perhaps the worst information problem of any market–many complex hard-to-measure outcomes most of which consumers (parents) cannot directly observe even after they’ve chosen a school for their child. Also, since students can realistically only attend schools near their homes, and there are economies of scale in running schools, that means there will generally be few practical options (unless you happen to live in a large city with great public transportation–very rare in the U.S.). And the transaction costs are very high to switch schools. And there are equity considerations. And … I could go on. Harris claims that a free market in education wouldn’t work because education is uniquely different from other markets. However, the challenges he lists – information asymmetry, difficulty measuring intangible outcomes, difficulties providing options in rural areas, transaction costs for switching schools – aren’t unique to K-12 education at all. Moreover, there is no such thing as an “unregulated” free market because market forces regulate. As I describe below, while not perfect, these market forces are better suited than the government to address the challenges Harris raises. Parents need information in order to select quality education providers for their children. But are government regulations necessary to provide that information? Harris has provided zero evidence that it is, but there is much evidence to the contrary. Here the disparity between K-12 and higher education is instructive. Compared to K-12, colleges and universities operate in a relatively free market. Certainly, there are massive public subsidies, but they are mostly attached to students, and colleges have maintained meaningful independence. Even Pell vouchers do not require colleges to administer particular tests or set a single standard that all colleges must follow. So how do families determine if a college is a good fit or not? 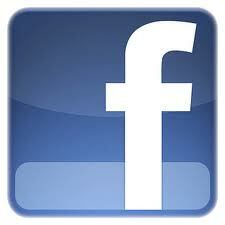 There are three primary mechanisms they use: expert reviews, user reviews, and private certification. The first category includes the numerous organizations that rate colleges, including U.S. News & World Report, the Princeton Review, Forbes, the Economist, and numerous others like them. These are similar to sorts of expert reviews, like Consumer Reports, that consumers regularly consult when buying cars, computers, electronics, or even hiring lawyers – all industries where the non-expert consumer faces a significant information asymmetry problem. The second category includes the dozens of websites that allow current students and alumni to rate and review their schools. These are similar to Yelp, Amazon.com, Urban Spoon and numerous other platforms for end-users to describe their personal experience with a given product or service. Finally, there are numerous national and regional accreditation agencies that certify that colleges meet a certain standard, similar to Underwriters Laboratories for consumer goods. This last category used to be private and voluntary, although now it is de factomandatory because accreditation is needed to get access to federal funds. None of these are perfect, but then again, neither are government regulations. Moreover, the market-based regulators have at least four major advantages over the government. First, they provide more comprehensive information about all those hard-to-measure and intangible outcomes that Harris was concerned about. State regulators tend to measure only narrow and more objective outcomes, like standardized test scores in math and English or graduation rates. By contrast, the expert and user reviews consider return-on-investment, campus life, how much time students spend studying, teaching quality, professor accessibility, career services assistance, financial aid, science lab facilities, study abroad options, and much more. Second, the diversity of options means parents and students can better identify the best fit for them. As Malcolm Gladwell observed, different people give different weights to different criteria. A family’s preferences might align better with the Forbes rankings than the U.S. News rankings, for example. Alternatively, perhaps no single expert reviewer captures a particular family’s preferences, in which case they’re still better off consulting several different reviews and then coming to their own conclusion. A single government-imposed standard would only make sense if there was a single best way to provide (or at least measure) education, we knew what it was, and there was a high degree of certainty that the government would actually implement it well. However, that is not the case. Third, a plethora of private certifiers and expert and user reviews are less likely to create systemic perverse incentives than a single, government standard. As it is, the hegemony of U.S. News & World Report’s rankings created perverse incentives for colleges to focus on inputs rather than outputs, monkey around with class sizes, send applications to students who didn’t qualify to increase their “selectivity” rating, etc. If the government imposed a single standard and then rewarded or punished schools based on their performance according to that standard, the perverse incentives would be exponentially worse. The solution here is more competing standards, not a single standard. Incentives and accountability also play a central role in the superiority of regulation by market forces. First, government regulatory agencies face no competition from alternative suppliers of quality and safety assurance, because the regulated have no right of exit from government regulation: they cannot choose a better supplier of regulation, even if they want to. Second, government regulators are paid out of tax revenue, so their budget, job security, and status have little to do with the quality of the “service” they provide. Third, the public can only hold regulators to account indirectly, via the votes they cast in legislative elections, and such accountability is so distant as to be almost entirely ineffectual. These factors add up to a very weak set of incentives for government regulators to do a good job. Where market forces regulate, by contrast, both goods and service providers and quality-assurance enterprises must continuously prove their value to consumers if they are to be successful. In this way, regulation by market forces is itself regulated by market forces; it is spontaneously self-improving, without the need for a central, organizing authority. In K-12, there are many fewer private certifiers, expert reviewers, or websites for user reviews, despite a significantly larger number of students and schools. Why? Well, first of all, the vast majority of students attend their assigned district school. To the extent that those schools’ outcomes are measured, it’s by the state. In other words, the government is crowding out private regulators. Even still, there is a small but growing number of organizations like GreatSchools, Private School Review, School Digger, andNiche that are providing parents with the information they desire. First, it should be noted that, as James Tooley has amply documented, private schools regularly operate – and outperform their government-run counterparts – even in the most remote and impoverished areas in the world, including those areas that lack basic sanitation or electricity, let alone public transportation. (For that matter, even the numerous urban slums where Tooley found a plethora of private schools for the poor lack the “great public transportation” that Harris claims is necessary for a vibrant education market.) Moreover, to the extent rural areas do, indeed, present challenges to providing education, such challenges are far from unique. Providers of other goods and services also must contend with reduced economies of scale, transportation issues, etc. That said, innovations in communication and transportation mean these obstacles are less difficult to overcome than ever before. Blended learning and course access are already expanding educational opportunities for students in rural areas, and the rise of “tiny schools” and emerging ride-sharing operations like Shuddle (“Uber for kids”) may soon expand those opportunities even further. These innovations are more likely to be adopted in a free-market system than a highly government-regulated one. Problem #4: Using all this evidence in support of the free market argument, but then concluding that the evidence is irrelevant. For libertarians, free market economics is mainly a matter of philosophy. They believe individuals should be free to make choices almost regardless of the consequences. In that case, it’s true, as Bedrick acknowledged, that the evidence is irrelevant. But in that case, you can’t then proceed to argue that we should avoid regulation because it hasn’t worked in other sectors, especially when those sectors have greater prospects for free market benefits (see problem #3 above). And it’s not clear why we should spend a whole panel talking about evidence if, in the end, you are going to conclude that the evidence doesn’t matter. No, because I don’t think it’s a wise move to eliminate a school that parents chose, which may be their least bad option. We don’t know why a parent chose that school. Maybe their kid was being bullied at their local public school. Maybe their local public school that they were assigned to was not as good. Maybe there was a crime problem or a drug problem. We’re never going to have a perfect system. Libertarians are not under the illusion that all private schools are good and all public schools are bad… Given the fact that we’ll never have a perfect system, what sort of mechanism is more likely to produce a wide diversity of options, and foster quality and innovation? We believe that the market – free choice among parents and schools having the ability to operate as they see best – has proven over and over again in a variety of industries to have better outcomes than Mike Petrilli sitting in an office deciding what quality is… as opposed to what individual parents think [quality] is. In other words, yes, test scores matter. But they are far from the only things that matter. Test scores should be one of many factors that inform parents so that they can make the final decision about what’s best for their children, rather than having the government eliminate what might well be their least bad option based on a single performance measure. I am grateful that Dr. Harris took the time both to attend our policy forum and to continue the debate on his blog afterward. I look forward to continued dialogue regarding our shared goal of expanding educational opportunity for all children. On Friday, March 4th at noon, the Cato Institute will be hosting a debate over the impact of regulations on school choice programs featuring Patrick Wolf, Douglas Harris, Michael Petrilli, and yours truly, moderated by Neal McCluskey. If you’re in the D.C. area, please RSVP at this link and join us! Come for the policy discussion, stay for the sponsored lunch! Is the evidence consistent with Overregulation Theory? We should be skeptical of the explanatory value of the study’s enrollment check. There is no good reason to assume that the correlation between enrollment growth or decline among the small sample of participating schools (which had significantly negative growth, on average) is the same as among all private schools in the state. Making such an assumption is like a blind man holding onto the truck of an elephant and assuming that he’s holding a snake. The study does not show the variation in enrollment trends among the participating and non-participating schools, but we could imagine a scenario where the enrollment trend among participating schools ranged, say, from -25% to +5% while the range at non-participating schools was -5% to +25%. As shown in the following charts (which use hypothetical data), there may be a strong correlation between enrollment trends and outcomes among the entire population, while there is little correlation in the subset of participating schools. In short, looking at the relationship between enrollment growth and performance in the narrow subset of participating schools doesn’t necessarily tell us anything about the relationship between enrollment growth and performance generally. Hence the study’s “check” that Bruno cites does not provide evidence against OT. Is there evidence that regulations improve performance? Joshua Cowen of Michigan State University also points out that there is previous evidence of positive effects from accountability rules on voucher program outcomes in other states (though regulations may differ in Louisiana). Ours is one study of what happened in one year for one school choice program that switched from low-stakes testing to high-stakes testing. As we point out in the report, it is entirely possible that the surge in the test scores of the voucher students was a “one-off” due to a greater focus of the voucher schools on test preparation and test-taking strategies that year. In other words, by taking the standardized testing seriously in that final year, the schools simply may have produced a truer measure of student’s actual (better) performance all along, not necessarily a signal that they actually learned a lot more in the one year under the new accountability regime. If we had had another year to examine the trend in scores in our study we might have been able to tease out a possible test-prep bump from an effect of actually higher rates of learning due to accountability. Our research mandate ended in 2010-11, sadly, and we had to leave it there – a finding that is enticing and suggestive but hardly conclusive. It’s certainly possible that the high-stakes test improved actual learning. But it’s also possible–and, I would argue, more probable–that changing the stakes just meant that the schools responded to the new incentive by focusing more on test-taking strategies to boost their scores. For that matter, even if it were true that the regulations actually improved student learning, that does not contradict Overregulation Theory. Both advocates and skeptics of the regulations believe that schools respond to incentives. Those of us who are concerned about the impact of the regulations don’t believe that they can’t improve performance. Rather, our concern is that regulations imposed from above are less effective at improving performance than the incentives created by direct accountability to parents in a robust market in education, and may have adverse unintended consequences. To explain: We’re concerned that regulations forbidding the use of a school’s preferred admissions standards or requiring the state test (which is aligned to the state curriculum) might drive away better-performing schools, leaving parents to choose only among the lower-performing schools. We’re concerned that price controls will inhibit growth, providing schools with an incentive only to fill empty seats rather than to scale up. We’re concerned that mandatory state tests will inhibit innovation and induce conformity. None of these concerns rule out the possibility (or, indeed, the likelihood) that over time, requiring private schools to administer the state test and report the results and/or face sanctions based on test performance will improve the participating schools’ performance on that test. Again: we agree that schools respond to incentives. We just think the results of top-down incentives are likely to be inferior to the results of bottom-up choice and competition, which have proved to be powerful tools in so many other fields for spurring innovation and improving quality. Can Overregulation Theory alone explain the negative results in Louisiana? [E]ven if regulation prevented all but the worst private schools from participating, this would explain why students did not benefit from transferring into them, but not why students would transfer into them in the first place. So Overregulation Theory might be part of the story in explaining negative voucher effects in Louisiana, but it is not by itself sufficient. To explain the results we see in the study, it is necessary to tell an additional story about why families would sort into these apparently inferior schools. Bruno offers a few possible stories–that parents select schools “that provide unobserved benefits,” that the voucher program “induced families to select inferior schools,” or that parents merely “assume any private school must be superior to their available public schools”–but any of these can be consistent with OT. Indeed, the second story Bruno offers is practically an extension of OT: if the voucher regulations truncate supply so that it is dominated by low-quality schools, and the government gives false assurances that they have vetted those schools, then it is likely that we will see parents lured into choosing inferior schools. That’s not to say that there are no other factors causing the negative results. It’s likely that there are. (I find Douglas Harris’s argument that the private schools’ curricula did not align with the state test in the first year particularly compelling, though I don’t think it entirely explains the magnitude of the negative results.) We just don’t have any compelling evidence that OT is wrong, and OT can suffice to explain the negative results. I will conclude as I began: expressing agreement. I concur with Bruno’s assessment that “it is likely that the existing evidence will not allow us to fully adjudicate between competing hypotheses.” Indeed, it’s likely that future evidence won’t be conclusive either (it rarely is), but I hope that further research will shed more light on this important question. Bruno concludes by calling for greater efforts to “understand how families determine where their children will be educated,” noting that by understanding how and why parents might make “sub-optimal — or even harmful” decisions will help “maximize the benefits of school choice while mitigating its risks.” These are noble goals and I share Bruno’s desire to pursue them. I just hope that policymakers will approach what we learn with a spirit of humility about what they can accomplish. New program discussions are still ongoing in North Carolina and Ohio. Even before knowing how these turn out, 2013 already represents a very solid year for the movement with two new states added to the choice family and some significant improvements to existing programs. UPDATE: Paul Diperna wrote me to note that Alabama passed both a refundable and a scholarship credit- meaning two new programs. Extra style points for Greg. Meet the two coolest things ever made in Sweden. Oops! It’s actually “decoupling public-school assignments from geography” that’s the Swedish idea here. Sweden has had a national system of universal school vouchers since 1993. They’ve even developed economically sustainable for-profit school companies. It’s so successful that about a year ago the Social Democratic Party, which I’m tempted to describe as Sweden’s socialist party but will instead describe as its more socialist party, decided not to try to kick the for-profit schools out of the system. Warren taught public school briefly and then quit rather than go through the obligatory, despair-inducing credentialing rigmarole (a fact that speaks better of her than almost anything else you’ll learn). I wrote last week about the release of the final research results from Milwaukee’s school choice program. On Sunday the Milwaukee Journal Sentinel devoted its entire editorial page to a discussion of those results. Check out the succinct summary of the findings by Patrick Wolf and John Witte. Also be sure to check out the response from the head of the teachers union, Bob Peterson. His rebuttal consists of noting that many students switch sectors, moving from choice to traditional public schools as well as in the opposite direction. He thinks that this undermines the validity of Wolf and Witte’s graduation rate analysis, but he fails to understand that the researchers used an intention to treat approach that attributes outcomes to students’ original selection of sector regardless of their switching. And on the special education claim he simply reiterates the Department of Public Instruction’s (DPI) faulty effort to equate the percentage of students who are entitled to accommodations on the state test with the percentage of students who have disabilities. For more on how DPI under-stated the rate of disabilities in the Milwaukee choice program by between 400% and 900%, check out the new article Wolf, Fleming, and Witte just published in Education Next. It’s not only an excellent piece of research detective work on how DPI arrived at such an erroneous claim, but it is also a useful warning to anyone who thinks that government issued claims provide the authoritative answer on research questions. Government agencies, like DPI, can lie and distort as much or more than any special interest group. They just do it with your tax dollars and in your name. My colleague at the University of Arkansas, Patrick Wolf, along with John Witte at the University of Wisconsin and a team of researchers have released their final round of reports on the Milwaukee school choice program. You can read the press release here and find the full set of reports here. They also find that “when similar students in the voucher program and in Milwaukee Public Schools were compared, the achievement growth of students in the voucher program was higher in reading but similar in math.” Unfortunately, the testing conditions changed during the study because the private school testing went from being low stakes to high stakes, making it difficult to draw strong conclusions about the effects of the program on test scores. In addition, it should be remembered that the design of the Milwaukee study is a matched comparison, which is less rigorous than random-assignment. The more convincing random-assignment analyses are significant and positive in 9 of the 10 that have been conducted, with the tenth having null effects. You can find a summary and links to all of them here. Perhaps the most interesting part of the new Milwaukee results is the report on special education rates in the choice program. As it turns out, Wisconsin’s Department of Public Instruction grossly under-stated the percentage of students in the choice program who have disabilities. Some reporters and policymakers act as if the Department of Public Instruction’s reports are reliable and insightful because they are a government agency, while the reports of university professors are distorted and misleading. Read this report on special education rates and I think you’ll learn a lot about how politically biased government agencies like the Department of Public Instruction can be.